Pros: Different tips for different uses, New tips are cheaper than new toothbrushes, easy to read smart guide, smart guide doubles as a nice clock, pressure indicators, cleans deep and effectively. Feels like you just got a cleaning from the dentist. Cons: Automatic brush can take a little bit of time to get use to. A little expensive for a brush. Takes up more space than a conventonal brush. Un-removable, rechargeable battery will die one day. Key Takeaway: The Oral-B Professional Care Smart Series 5000 is the top automatic tooth brush available in 2011 and is sure to give you a great teeth cleaning. It may cost more up front but it will certainly pay itself off in the long run with cheaper dentist visits and cheaper brush replacement costs. 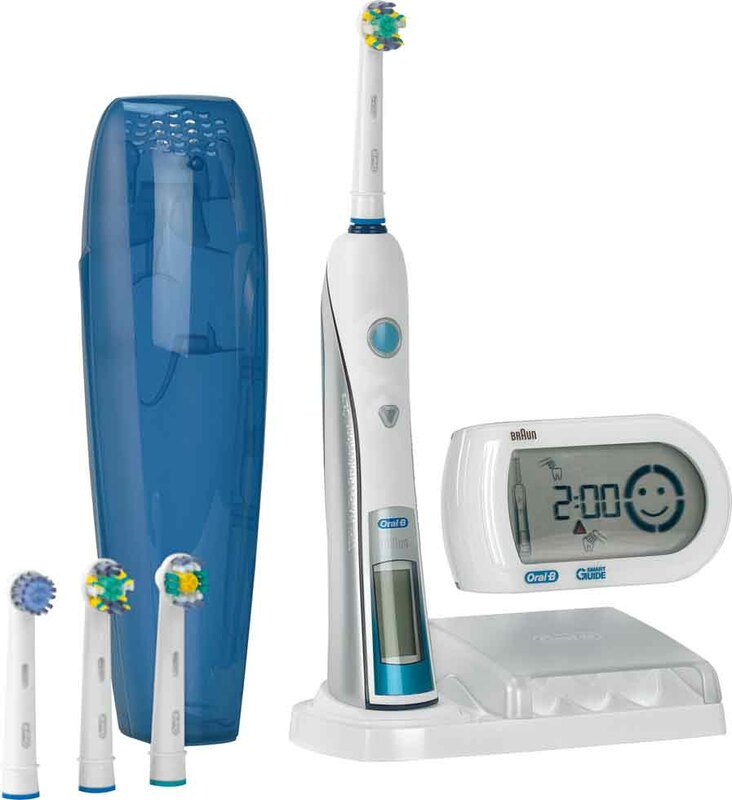 The Oral-B Smart Series 5000 is an amazing product for all consumers to use. Products like these can really help prevent cavities. The Brush Heads are what really makes the Oral-B automatic toothbrushes stand out. These toothbrush heads need to be replaced every three months or so like a regular toothbrush would. They are much cheaper than buying a toothbrush if you buy them in packs of three or so. Amazon usually has good sales. The modern brush heads work on the following brush handles that Oral B Makes. I have been using the Oral B Smart Series 5000 for over six months now and have been very pleased with it. The whole unit feels extremely well built so you do not have to worry about it breaking. The battery lasts me around a week on a full charge at two brushes a day for 2-3 minutes. Yes I know I should probably brush three times a day, but this is my review so deal with it. The base for the charger is completely white. You cannot see where any of the contact points are for it either. As for charging time, I find that if I put it on the charger before going to sleep, the brush is done charging by the time I wake up. And I only sleep 4-5 hours a day usually. (I know, I am working on it…) Because this battery is not meant to be replaced and is rechargeable, it will eventually reach the point where it will no longer hold a charge. Currently I have not reached that point. If I ever do, I will be sure to update the article accordingly, detailing my usage. Note: If you just purchased this toothbrush and it does not look like it is charging when you first sit it down, do not panic. Let it sit for a few hours and it will charge up. The tips are well made and will last you at least three months if you are brushing normally. I suggest that you try several different types if you can. That way you can see which one best fits you, or you can switch between them. Each brush comes with little colored bands that help identify whose brush tip belongs to who. They tend to stick on pretty well… except that first time I put it on wrong and it went flying. But other than that there were no problems. What is the difference between the Oral B Triumph (Triumph 9900, etc.) and the Oral B Smart Series? Although there are some slight differences, the brush unit, smart guide, and brush tips themselves remain the same. You can find more information on our Differences between Oral B Triumph vs. Oral B Smart Series article here. Can I bring the Oral B Smart Series 5000 on a plane? As a matter of fact, yes you can. HOWEVER, you must disable the transmission function on the brush. This is the part that lets the brush communicate with the Smart Guide. Don’t worry you can enable afterwards. You can find out how to bring the Oral B Smart Series 5000 on a Plane and Disable/Enable Transmission here. If you do not care about the Smart Guide and don’t want to have to worry about this, you should just get the Smart Series 4000, as that is the only difference. What is the difference between the Oral B Smart Series 5000 and the Smart Series 4000? The only difference is that the Smart Series 5000 has the Smart Guide, and the Smart Series 4000 does not. So what is this Smart Guide I keep talking about? Well the Oral B Smart Series 5000 comes with a little device (as pictured above.) It doubles as a clock for the bathroom, but its real feature is to help you brush smarter. The smart guide tells you how long you have been brushing, and lights up if you are brushing too hard. This will help make sure that you are brush all the 4 quadrants of your mouth long enough, and with enough pressure. It definitely helps. And the winking smiley face that comes up when you have completed your 2 minute brush is encouraging. If you want to use your brush and smart guide but have a flight, you must disable the transmission on the toothbrush first. See the disable instructions here. So… How good of a brush do you get from the Oral B Smart Series 5000? Now for what many of you have come here for. How good has this brush been for me? The short answer is that it has been GREAT. Prior to using this brush, I would go and buy the most expensive regular brush and toothpaste, while brushing twice a day. During this time, I was told that I had lots of plaque and minor Gingivitis (gross!). I also had a few questionable teeth that were looking a little like cavities. Just after 3 or 4 months of use, my Gingivitis was gone. I had almost no plaque what-so-ever, and my dentist thought I was flossing even though I don’t. Thanks Floss Action Brush Tip! I know, I know… I should start flossing too. The toothbrush flossing tip is a help though. Anyways, my teeth are also a little whiter than before as well. Other people have indicated that they received varying results in terms of whiteness, but you will most likely get a few shades lighter too. Everytime I use the brush, I feel like I just came from the dentist. It is invigorating to a small degree, especially when you use it in conjunction with a good toothpaste. Yes I know it is expensive to move from a normal brush to an automatic toothbrush, but do it. After your initial investment, all you will have to do is buy new tips – which can be cheaper or the same price as a toothbrush if you buy several at once. This will help make up for some of the cost. Plus this comes with a tip already that is good for months. You also will be taking much better care of your teeth. This can save you and your family a ton of money. I stand behind the Oral B Smart Series 4000 and 5000 firmly. 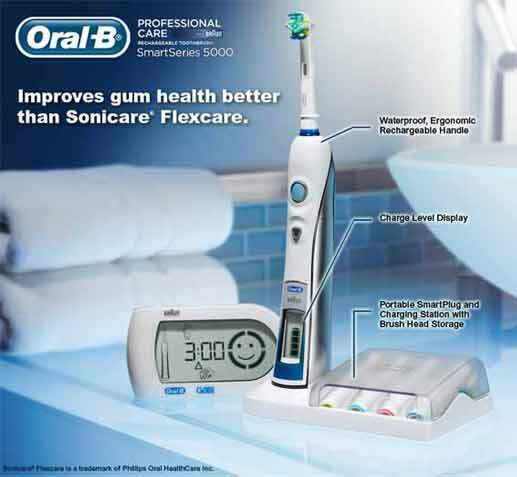 And because of the Oral B Professional Care Smart Series 5000 and 4000 recieves a rating of 5/5! Now all you need to do is decide if you want a Smart Guide to help you brush long enough, and not too hard. This entry was posted	on Tuesday, January 10th, 2012 at 6:14 PM	and is filed under . You can follow any responses to this entry through the RSS 2.0 feed. You can leave a response, or trackback from your own site.